Marshall M. Fredericks Sculpture Museum | Unidentified sketches of various animals and female torso, possibly "Torso of a Dancer"
Unidentified sketches of various animals and female torso, possibly "Torso of a Dancer"
Unidentified sketches of female torso and various animals, including horses, leopard, lions, mountain goat and ram. Sketches include early concepts for "Torso of a Dancer," "Siberian Ram" and the "Levi L. Barbour Memorial Fountain" on Belle Isle. 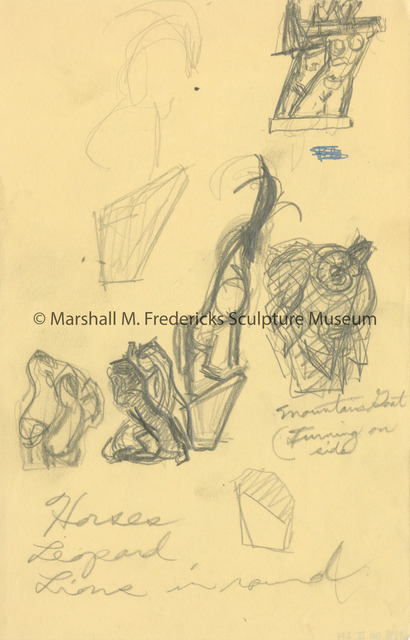 Fredericks, Marshall M., 1908-1998, “Unidentified sketches of various animals and female torso, possibly "Torso of a Dancer",” Marshall M. Fredericks Sculpture Museum, accessed April 26, 2019, http://omeka.svsu.edu/items/show/7724.